I'm still on a strawberry kick, but just with dishes! I love using these Pier 1 strawberry plates in the warm months. The pitcher is from Sur La Table, years ago. This pretty teacup is one from my friend Rosie's Mom's collection. It's called , appropriately, Strawberry, by Royal Grafton. It looks like a Royal Albert, doesn't it? It has such a vintage look to it that I just love! Before we get to the recipe, I wanted to share a picture of two little flowers that were spotted at the Dallas Arboretum! They are cousins and two of my granddaughters. My youngest son and DIL invited me to brunch overlooking White Rock Lake, at the arboretum. What a fun day! Oh my, these chocolate chip cookie bars, recipe from King Arthur Flour are so chewy, moist and downright delectable! Don't you just love making bars instead of cookies? They're so much easier! I had several opened bags of chocolate chips and butterscotch chips in my pantry (how'd that happen?? ), and used them all up. *Use 1 teaspoon salt if you use unsalted butter. Preheat the oven to 350 degrees. Lightly grease a 9" x 13" pan. (Since I used a glass dish, I turned the oven to 325 degrees. Allow the mixture to cool slightly (if it's very hot to the touch), then add the eggs one at a time, beating well after each addition. Scrape the sides and bottom of the mixing bowl midway through this process. Bake the bars for 30 to 32 minutes, until they've risen, and their top is shiny and golden. Bake for the shorter amount of time in a darker pan; the longer time in a light/shiny pan. A cake tester inserted into the center won't come out clean; in fact, the center of the very middle of the pan may look quite molten when you dig into it. But so long as no wet batter is showing farther out towards the edges, the bars are done. As they cool, the center will solidify. Remove the bars from the oven, and use a heatproof spatula to press down the risen edges; this will make bars with flat, rather than humped tops. Let the bars cool completely before cutting; overnight is best. Once bars are cool, wrap airtight. Store wrapped bars at room temperature for a couple of days. I ended up freezing the extra bars. When I want one, I thaw in the microwave and then heat for a few seconds....sooo good! Yield: 2 dozen nice size bars. Wow oh Wow!! LOVE that strawberry pitcher and plate. They are so very cool. The tea cup is pretty as well. Yes it does look like a Royal Albert. Another scrumptious recipe, Kitty; oooooh my waistline! You have the cutest strawberry-themed dishes, Kitty! 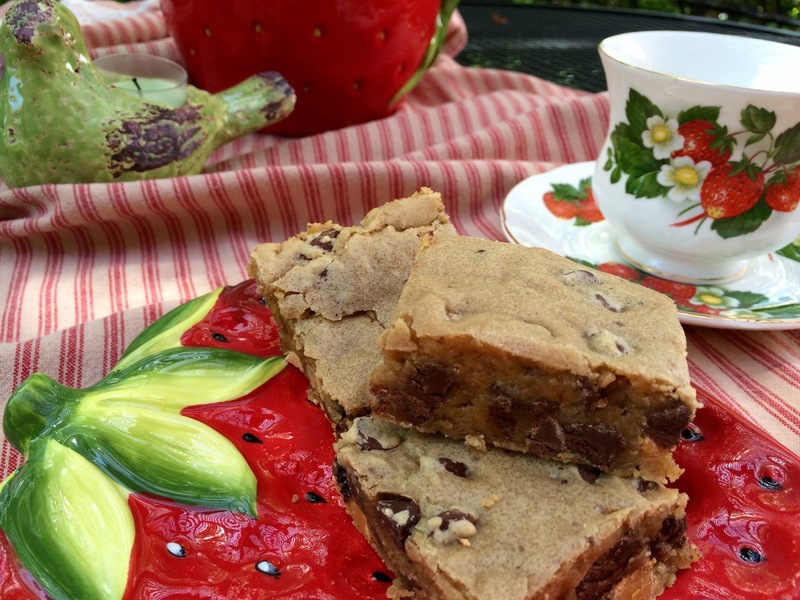 Your chocolate chip cookie bars are perfect for tea parties since you can cut them to "bite-sized" proportions. I'm also admiring your Adirondack chairs in the background. One of the local stores is selling resin Adirondack chairs in my favourite colour (PURPLE!!!) and I can't stop thinking about them! Thank you for joining Thoughts of Home, sweet Kitty. Those two little cuties are precious and so pretty. ummm on the bars...they look so delicious. Wow those are the best kind of flowers! What a couple of cuties! The arboretum is my kind of place to visit! That recipe looks delicious. I havne't made bars in years. Oh Kitty your Grandbabies are so adorable! I know you had a marvelous time brunch-ing at The Arboretum! I have to say I'm loving your strawberry kick and when you throw in the chocolate chip bars you've got a real winner! Yummy chocolate cookie bars! Oh my. They look so pretty served with your strawberry dishes. Love your smiling grands-so precious. I love the arboretum in Dallas-such a beautiful place. Hi Kitty, what a wonderful setting with the strawberry themed pretties and your darling grand daughters. They are so cute and they capture the heart with their sweet smiles. What a nice time you must have enjoyed at the arboretum in Dallas. Thank you for sharing the bar recipe. Oh they look so good. I love those strawberry plates! The teacup is lovely! Your granddaughters are so cute! What a cute setting, Kitty. I love your striped runner trimmed with lace; very pretty! I'm guessing you made that, didn't you? Your strawberry theme is so perfect for this time of year and oh my goodness, those bars! Yum, yum! Your little ones sure are cuties! Thanks for sharing your lovely post and have a wonderful week, my friend. Yummy! Our youngest son is flying in tonight for business (his company's headquarters are close by -- yay! ), and he would love these! I also have opened bags of chocolate and butterscotch chips, haha! Love those little cutie-pies! How nice you got to spend time with them. 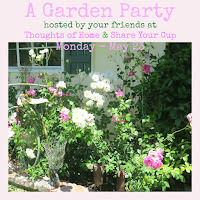 Your backyard teas always look so restful and pretty. I love the strawberry theme. And yes, I thought that teacup was a Royal Albert when I saw the handle. Kitty, your little flowers are adorable. Love visiting and lunching at the Dallas Arboretum. Thanks for sharing the yummy recipe. I'd keep using the strawberry china for tea, it's so pretty. Dear Kitty, your little tea party is adorable. I never tire of strawberries and who could ask for more with espresso and chocolate chips?? Not me! Thank you so much for your encouraging words on C.R. I am feeling better and itching to get back to my homemaking blog. I hope you will join me when you have a spare moment! Kitty, your table runner and strawberry dishes are so pretty for this time of year. The chocolate chip bars sound delicious, and you're right - bars are so much easier than cookies. I think they stay moister, too. Kitty, I love the strawberry theme. The pitcher is great to hold flowers and looks so pretty with the cup and saucer. I see you have two adorable little ones to keep you busy and your lunch with family had to be so sweet. Thanks for sharing your cuties and your pretty tea. Oh, had to mention how much I love the lovely table runners. Your granddaughters are adorable! What a beautiful setting to spend the day as a family. The strawberry themed table complete with the wonderful runner makes me so excited for summer to begin. Can't wait to try this bar recipe. I'm never happy with my cookie baking skills so this is a delicious alternative. These bars will be a big hit over the summer. What sweethearts. I know you love them dearly. I think your bars look wonderful and would be quickly be gone if we could just get our hands on one! Thanks for sharing and linking. Your tea time is absolutely summery, Kitty. 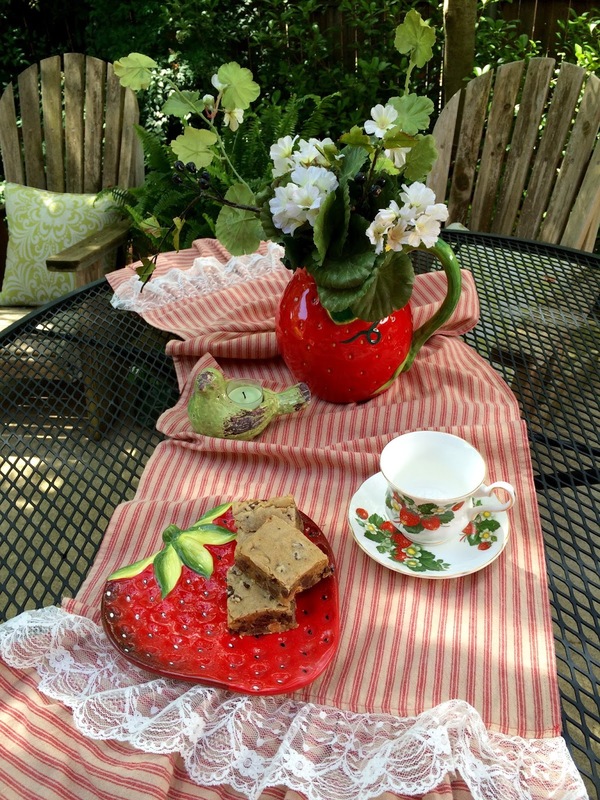 Love that tea cup - and your sweet strawberry plate is perfect too! I used to love going to the Arboretum when I was a child. I think I need to make a visit. Your grands are adorable and those cookies look delicious. What precious little girls, Kitty & what a nice adventure you shared with them!! Thanks, too, for sharing that bar recipe. I often bring cookies to my quilt guild meetings & this recipe will come in handy...can't wait to try making them. Love the pretty ruffles on the runner...very feminine!!! Of course, the teapot & strawberry teacup/saucer are making my ♥ beat faster! Kitty, I adore your two little flowers! Your bars look and sound oh so tempting! I agree, bars beat cookies hands down and I have some open baking chips in my pantry too :) Love your pretty strawberry teacup, pitcher and plates! Those bars look SOOOOO yummy!! Thanks for sharing the recipe! Love your strawberry things as well - so bright and cheery! A delightful post Kitty. I have been wanting a strawberry teacup and have been looking at them. I have one in my cart on Etsy like your's..considering it. The plates are so cute. Oh the Dallas Arboretum, my heart and soul love that spot of heaven along White Rock Lake! What a joy for you to join your family for lunch there and just look at your two cuties! Love a good bar over a cookie any day. My Mom made the best chocolate chip bars too and your recipe sounds very similiar! Those chocolate chips bars look divine! There is a lovely arboretum in MN. Your grands are darling! Oh you're killing me Kitty, I was just wishing for a cookie and now to see those thick chocolate cookie bars, I'm drooling!! Adorable little girls! 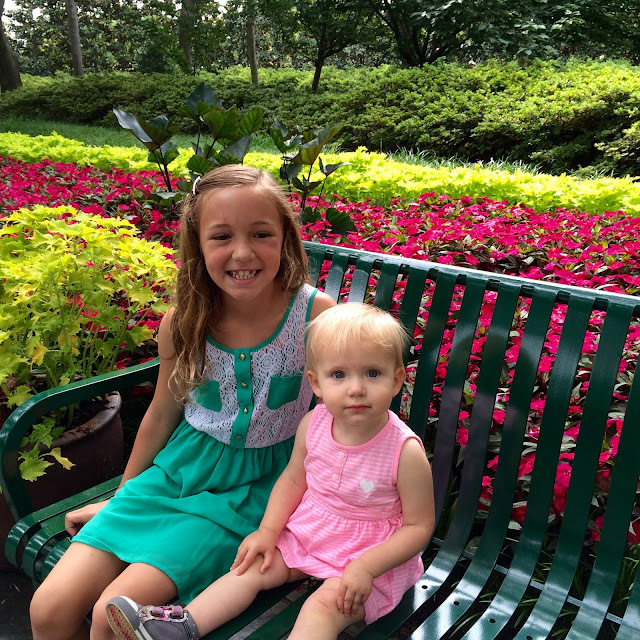 Three wonderful treasures- your grandchildren, chocolate chip cookie bars , and the Dallas arboretum! Kitty, I love your strawberry dishes as well. I love these bars and have made them before. Your grands are so cute!! Thanks for sharing with the Garden Party sweet friend! What precious littles! Thank you for being a lovely flower that joined our garden party. Sweet flowers sitting on a garden bench. It looks like a lovely day in more ways than one. Love the strawberry cup. I have not seen one that before. Yes, this Royal Grafton cup reminds me of Royal Albert. I have not made bars in a long time. What a sweet post, Kitty! Your tea time with your lovely strawberry cup so perfect for late spring! Thanks for sharing your recipe for the bars! Have a wonderful Memorial holiday! Adorable granddaughters, pretty dishes and lovely cookies. Heaven. Your Chocolate Chip Cookie Bars look delicious, and a perfect treat for these holidays. I am hoping we have just one day this weekend with sunshine, we are floating out here. Thanks so much for sharing with Full Plate Thursday and have a great weekend! Hello, my dear and sweet friend! How are you, Kitty? Oh, how I have missed you! May you enjoy the long weekend, dear one. Know that you are in my thoughts! Love you! Well of course you have a strawberry plate to match your strawberry teacup! LOL! Looks like you had some special time with your beautiful granddaughters! Sweetest flowers in the arboretum too! I love chocolate chip bars with coffee!!! Your bars look so yummy! 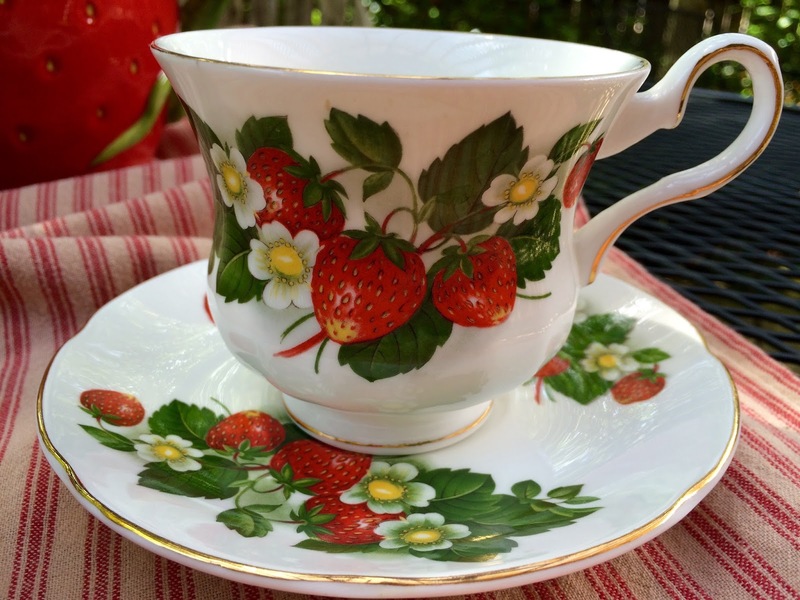 Love that beautiful strawberry teacup! All my teacups are of the floral variety. What a fun change of pace that strawberry cup is. Your granddaughters are adorable. How lovely that you were able to enjoy brunch with them. Yes, bars are so much easier than cookies. I choose them any day. And those chocolate chip bars definitely look yummy. I need to pick me up some chocolate chips when I go to the store today...you've got me in the mood to bake. After a long blog break (with the exception of a couple quick posts on my classic film blog), I've decided to rejoin the blogging world. I welcome you for a visit, if you have the time.